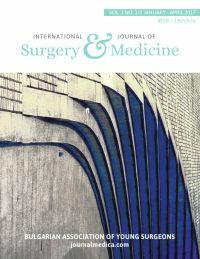 It is the policy of International Journal of Surgery and Medicineto require a declaration of conflicting interests from all authors enabling a statement to be carried within the paginated pages of all published articles. IJSM believes that to make the best decision on how to deal with a manuscript the journal editor should know about any competing interests that authors may have. We are not aiming to eradicate competing interests as they are almost inevitable. We will not reject papers simply because authors have a competing interest, but these will be declared on the published paper. A competing interest exists when professional judgement concerning a primary interest (such as patients’ welfare or the validity of research) may be influenced by a secondary interest (such as financial gain or personal relationship). There is nothing inherently unethical about a competing interest but it should be acknowledged and openly stated. Examples of competing interests include the following: board membership, consultancy, employment, expert testimony grants (including pending), contract research, lectures/other education events, speakers’ bureaux, patents (planned, pending or issued), receipt of equipment or supplies, royalties, stock/stock options/other forms of ownership, additional expenses not included in COIs already specified, other personal or professional relationships that may influence or appear to influence. Competing interests should be included in a statement headed “Competing Interests” at the end of the manuscript file (before the references).